The cubicle jungle. From "Office Space." "When I find myself in a position like this, I ask myself: 'What would General Motors do?' And then I do the opposite." On my right calf is a tattoo of a UPC code that expresses far more concisely and profoundly than language how I feel about doing a job just for the paycheck. It's the bar code from Nirvana's "Nevermind" album -- you know, the one with the naked baby boy swimming after the dollar bill on a fishhook. It's my little private joke -- and constant reminder -- about feelings of depersonalization I felt at old jobs. And if you've ever been employed at a place that made you feel like a shrink-wrapped product, or like you were just treading water until the next paycheck (and who hasn't?) ... well then, you know what it's like. Movies and television usually deal with work in generic ways: The characters have jobs, and we sometimes even accompany them to work, but we rarely get a feeling for what it's like to actually do their jobs. That's why Kevin Smith's "Clerks" (and now its sequel, "Clerks II") connects with many people who have spent (or spend) so much time in tedious drudgery at low-level jobs where they are forced to interact with extremely unpleasant people -- either the unwashed public or nut-bag co-workers. Any movie can find material for comedy or drama in the clash or crash of business titans. 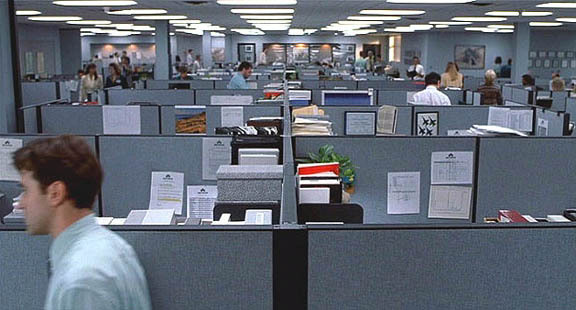 But the films that can capture the everyday trials, betrayals, temporary triumphs and perpetual humiliations of low or mid-level jobs without succumbing to soul-numbing tedium themselves — now, that is an achievement worthy of a copper-plated, adhesive-backed Employee of the Month plaque. We'll have a party with refreshments to congratulate the achievers and present the plaques Thursday, from 3 to 3:25 p.m., in Meeting Room C. Bring your own coffee cups. Continue reading here -- and, while you're at it, check out Kim Morgan's related piece about working girls (which is why I didn't include "His Girl Friday, "The Apartment" and a few others), called "Work It, Ladies." Next Article: Chasing the image: Office spaces Previous Article: Opening Shots: 'The Good, the Bad and the Ugly"